Healthy ingredients are a key part of Thai cooking. 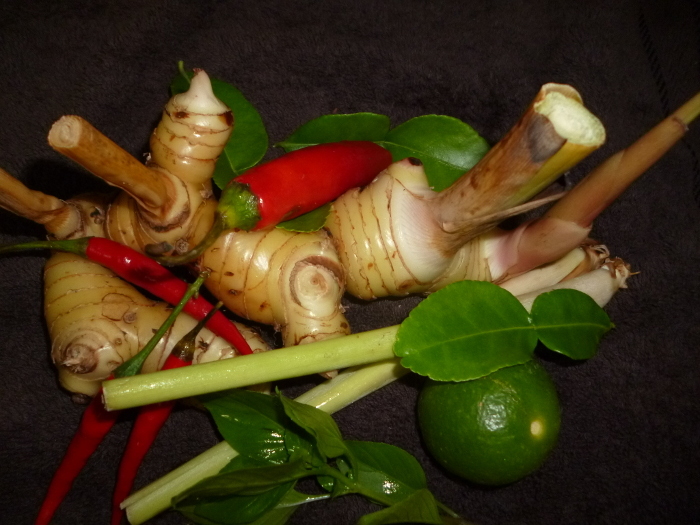 can be found in many Thai dishes like curries or soups. in many soups or salads or curries. is mostly in soups. looks like ginger but taste like lemon. very hard / not good to eat. you can use lime in nearly every dish. like soups or salads or even noodle dishes. in many Thai dishes like curry, salads or fried vegetable with pork/chicken etc. sweet Thai basil is a lot in Thai dishes and curries or just use it fresh in many salads or soups. a must in the green curry! mostly used in green Thai curry, or in some fried vegetables dishes. use in many dishes but as tamarind juice, for pad thai, salads, soups, fried fish ctc. use in every Thai dishes, but be-careful with it. very spicy! if you can not eat very spicy you use sweet chilies…. like pepperoni in Europe.